If you are looking for a flagship device running stock Android, then the Nexus 6P is the device for you. It has a great camera, vibrant display and overall good performance. However, if you want a smartphone that can give you more than just stock Android performance, then we suggest you take a look at the Samsung Galaxy Note 5, OnePlus 2, Sony Xperia Z5 and the LG G4, before making your decision. Flagship smartphones today boast of state-of-the-art specifications, a brilliant camera, and the ability to do everything a smartphone should be able to do, along with a little bit more. Nexus smartphones were designed to show users what Android smartphones could do, and the best part about owning a Nexus device was that they weren’t very expensive flagships. Look at the Nexus 4 or the Nexus 5 that were the first devices to be accepted in the mainstream smartphone market. The devices, at launch, were priced around the 25k mark, and showed the raw capabilities of an Android smartphone. Sure, they had their shortcomings when it came to the camera or battery life, but they were great smartphones nonetheless. With the Nexus 6, it looked like Google had lost track. The smartphone was too big, too bulky, and while the performance was good, the biggest drawback was that it didn’t bring with it the impact the previous generation Nexus smartphones did. The question is whether Google can hold the same position in the flagship market with the larger, more expensive Nexus 6P. 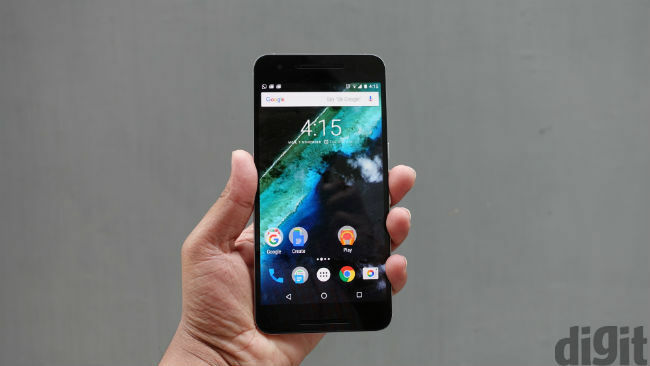 With smartphones like the Samsung Galaxy Note 5, OnePlus 2, LG G4 and more gunning for the top spot, does the Nexus 6P have what it takes to be the best Android flagship out there, or have third party OEMs taken that position? Well, lets kick things off with the build and design of the Nexus 6P. Huawei has gone all out with the build of the Nexus 6P. The smartphone has an aluminium body that makes it feel very premium. The device is big too, so one-handed operation takes some getting used to. Because the smartphone is wide, it’s a breeze typing on the keyboard. The Nexus 6P was constructed for two-handed operation, and that’s where it shines. Coming to the back of the device, the Nexus 6P comes in two colour variants – black and silver. We had the silver unit for review, and even though a majority of the Digit team prefers the silver variant, I personally liked the black one a lot more. The rear of the smartphone has the traditional Nexus branding, above which lies the fingerprint sensor – Nexus Imprint (we will talk more about this in the performance section). Above the fingerprint sensor, we have the bulge for the camera. During the launch of the smartphone, I thought that the bulge would make the device ergonomically inconvenient, but that isn’t the case. The camera housing that has the bulge is almost negligible. In fact, it is just the right amount to identify which side is the top of the smartphone without looking at it, and that’s a good thing. Coming to the front, its simple, with no physical buttons. Held in landscape mode, either side of the display has the stereo speakers just like we’ve seen on countless HTC smartphones, and the speakers are crisp and loud. The right of the smartphone has the power button and the volume rocker. The power button is textured to distinguish it from the volume rocker, but once you start using Nexus Imprint, you can say goodbye to the power button. The left of the smartphone has the SIM card tray. 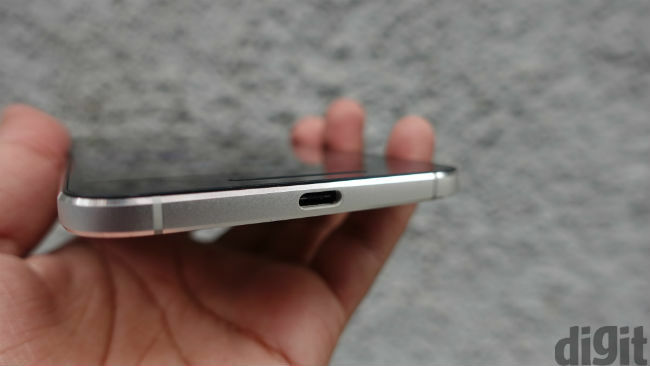 The bottom of the smartphone has the USB-C port. A good thing about the Nexus 6P is that it comes with a cable, with USB-C ports at both ends, and one with the traditional USB-to-USB-C port as well. 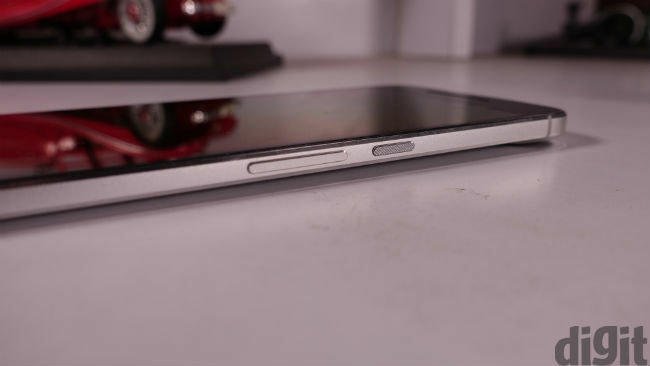 Overall, the smartphone has a slim and elegant design, and its build is good, too. The only downside is that the phone is a little too big to keep in the average jeans pocket, and you will get a lot of stares for that bulge in your jeans – which is only the phone! Coming to the display of the smartphone, it has a 5.7-inch AMOLED display with a resolution of 1440x2560 pixels, giving it a pixel density of 518ppi. The display is crisp, and is very clear. Whatever you do on the device, be it playing games, watching YouTube videos, movies or reading a book, the display is as good, if not better, than the one that we have seen on the Samsung Galaxy S6. This is keeping in mind real world usage, of course. The colours, at times, may appear over saturated but the overall performance of the display is very good. There are times when the auto brightness setting keeps the display dimmer than I’d like, but that’s mostly for well-lit and outdoor scenarios. One of the things that I love about a Nexus smartphone is the stock Android UI and that’s what we have here – Android 6.0 Marshmallow. 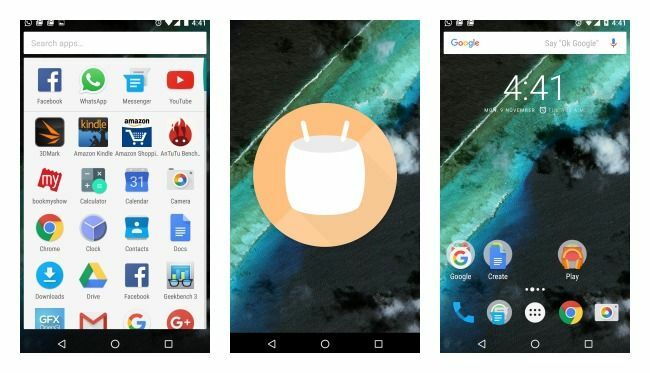 If you are running Android 5.1 Lollipop, then you will feel right at home here. There is some difference with the app listing in Marshmallow. Instead of horizontal scrolling, you now have vertical scrolling. At the top of the app listing you have four apps that change, based on your usage. So, for example if you open YouTube, Facebook and WhatsApp first thing in the morning, these apps will be at the top of the app listing. Similarly, if, in the afternoon, you read news apps, then these will be at the top. It’s really convenient to see the listing change based on your usage. Overall, the UI is simple, clean, and stock Android – just the way I like it. Kicking things off with the battery life of the smartphone, here is where I faced a bit of a hiccup. 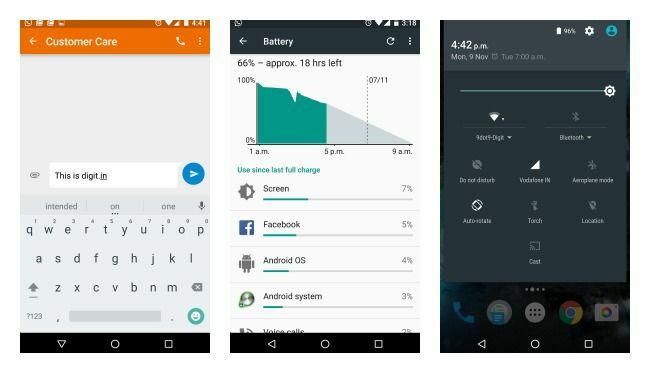 Android M boasts of the ability to consume minimum battery when the smartphone is kept idle. Sometimes this worked, and sometimes there was a drastic dip in battery life (more than 25%) when it was idle, while I was asleep. It is possible that this happened due to background app downloads, but the problem was present. Another inconsistency with the battery life was its overall performance. During some heavy days of use the smartphone really performed and was alive till the end of the day. At other times, the device was idle for most of the day and reached 20% battery level by night. It is possible that the battery in the unit I received was faulty, but overall, the battery performance of the smartphone is average at best. Coming to the gaming performance, it is great. The smartphone ran every game that I played on it. The front-facing speakers too are loud, adding a more immersive experience to gaming. With other everyday performance like calling, the device works well. The earpiece is crisp, and the bottom speaker works as the loudspeaker for calls. There were times when the person at the other end had difficulty in hearing me but since this happened only a few times, I am going to blame the network coverage for it. Multitasking is one more place where the Nexus 6P performs really well. You can have about 30 apps open, and not see a dip in performance. Sure, we have seen the same with slightly cheaper smartphones, but the way the Nexus 6P handles multitasking is commendable. 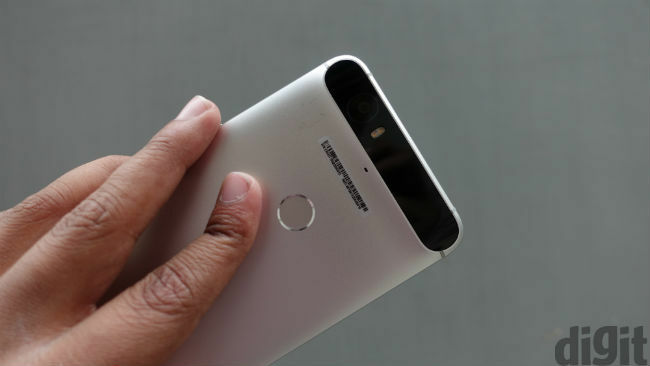 Coming to Nexus Imprint on the Nexus 6P, the fingerprint sensor just works. I recommend that during calibration you put your finger in the most awkward positions. This will ensure that even when you touch the fingerprint sensor slightly off the middle mark, it will recognise your fingerprint, and work. The fingerprint recognition is really fast, too – just touch it, and you are directed to the home screen in a heartbeat. The location of the fingerprint sensor is convenient – at the back of the Nexus 6P, right below the camera. It's right where your index finger would naturally go, making the task of unlocking the device feel very natural. I don’t know how I will go back to my old smartphone that doesn’t have a fingerprint sensor after this. One of the biggest criticisms of past Nexus smartphones has been the underwhelming camera. The camera of the Nexus 6P isn’t the best in the market, and we have devices such as the iPhone 6s Plus and the Samsung Galaxy Note 5 that hold this position. But, that doesn’t mean that the camera on the Nexus 6P is bad, by any measure. Here is a look at some pictures that I clicked during the day, and the night as well. There is an HDR+ mode that’s enabled by default, and if you want, you can switch it off. Overall, I liked the camera performance of the Nexus 6P. It isn’t the best flagship camera out there, but it deserves a spot in the Top 10 nonetheless. If you are one looking to pick up a flagship smartphone with stock Android, then by all means, go ahead and pick up the Nexus 6P. The device has impeccable performance, a great camera, vibrant display and a good build. Where it lacks is its size. It is too big for one-handed operations. Other than that, this is one smartphone that deserves the title of being the 'best flagship stock-Android smartphone'. is nexus 6p worth it phone ?